B. Thomas (Arlington, Texas, United States) on 12 December 2017 in Animal & Insect. 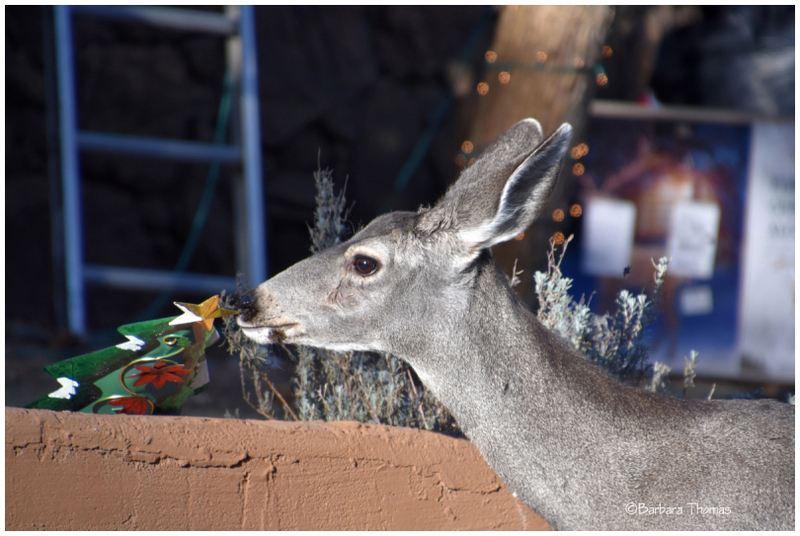 A doe is checking out a Christmas decoration in someone's front yard in Upper Canyon, Ruidoso, New Mexico. She decided it was not good to eat, and moved on. . . only one way to find out ! Smell and decide ...very curious ! Lovely capture ! !Happy ST ! :)) A lovely shot for a Silly Tuesday!!!! It's a very good question. Deer seem to eat almost anything. An excellent capture of this deer. Ha ha, she will probably swing back this way later to double check. Great clarity and light captured here!! Oh, to hear those jingle bells clanging in its mouth.